Bye bye, October! You were a lovely month indeed. My sweaters and darker nail polishes have started making more frequent appearances, and I have officially packed away my summer shorts. Hooray for being able to wear jeans and scarves again, finally! I'm back to using my faithful Lancôme Hypnôse mascara. I stocked up on some Lancôme products this past summer during our cruise in the duty free shop, and have been using Lancome Hypnose mascara again this past month. I have now officially decided that this is my holy grail mascara. I've used some of the other ones from Lancôme, and although they are nice, too, this one makes my eyelashes look even longer and thicker. Also, it stays on the whole day, but it's still easy to remove. I walk past a Steve Madden store every day after work, and have seen this pair of Croquetl skull loafers on display, but never thought to try them on. Recently, we were wandering around a department store and they happened to have a sale on Steve Madden shoes. so I decided to get this pair. 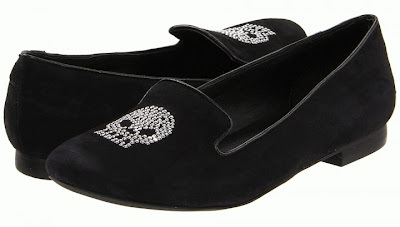 I'm such a big fan of loafers, and the rhinestone skulls were too cute to pass up. This past month two of my friends from South Africa came to visit me in Taiwan. They gave me a beautiful dainty gold ring as a gift. The one I have has a light blue/green stone, but I couldn't find it online, as I don't know where they bought it. It's almost identical to the one in this picture though. I really love it and I'm definitely on the lookout for more stack-able little gold rings. I've used so many new nail polishes this past month, but OPI "Miami Beet" was my favorite. I bought this one last year and only used it once, as it needs at least three coats to be completely opaque, and most of the time I don't have the patience to do three coats. It actually looks darker on my nails than it does in the bottle, and it's a gorgeous dark burgundy color with a blueish-purple undertone. For two months in a row now I've had Soap & Glory products in my favorites posts. This Soap & Glory "Clean On Me" body wash was one of the products I bought at Boots when I was in Dubai and used it this past month. I'm really bad at describing smells, but this one leaves my skin smelling clean and fresh, and the fragrance will stay on me for a while. I adore this body wash and will buy it again in the future. Obviously, I've been a little skull-obsessed this past month. 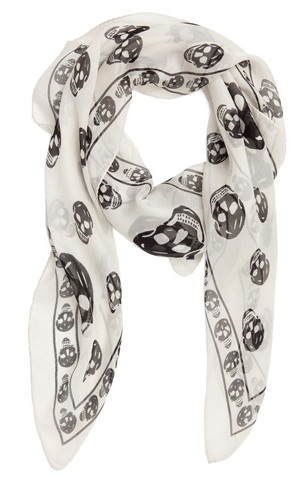 I absolutely love my white, skull print scarf and it's been perfect for fall; very light and sheer. I'm thinking of getting some other colors, too. What has been your favorites from the past month? I'm glad to hear you love it, too! Isn't it amazing!? If you are looking for a good contextual ad company, I suggest you take a peek at Clicksor.